Zion Guru guides are selected as technical experts, with exceptional facilitation and group management skills. Our guides also have holistic specialties, connecting all aspects of the day exploring geological wonder, as a journey through body, mind, and nature. This is our most popular canyoneering event. 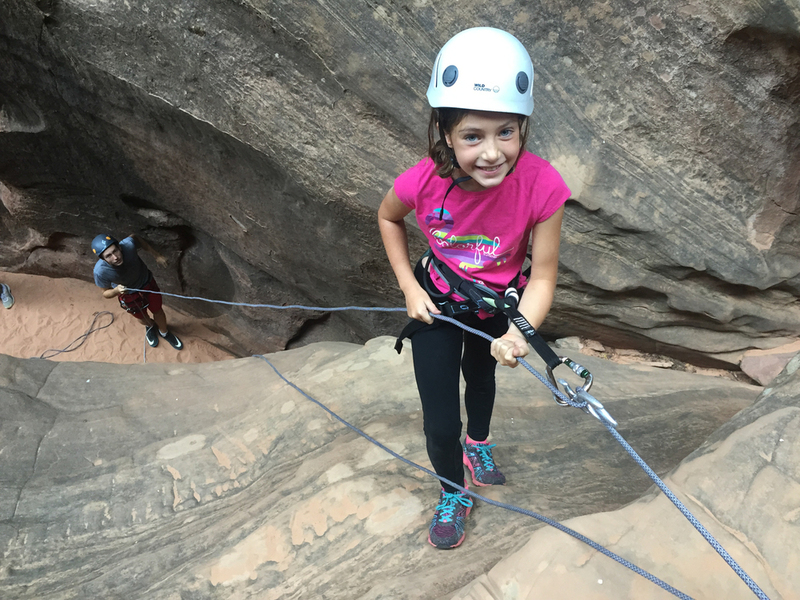 Beautiful hikes, rappels in slot canyons ranging from 20 to 175’ (higher if appropriate for the group), high technical safety standards, and gentle, empowering group facilitation skills. We emphasize Leave No Trace, community building within the group dynamic, and interactive problem solving of natural canyon obstacles..
Canyoneering descents may include down-climbing and swimming; if no swimming is desirable just let us know. Full-day trips usually include 2x to 3x the amount of canyon travel as half-day trips. All canyoneering trips are private, you and your group only. There is no guiding allowed in Zion National Park Wilderness. No commercial canyoneering guide service is allowed in canyons such as The Subway or Pine Creek. All Zion Guru trip providers are licensed and permitted for access on public and private lands outside the boundaries of Zion National Park. We have access to over 25 different canyons in the Zion area, both east and west of Zion. We choose and change our locations to best serve you. We can coordinate locations with your travel plans. If you are headed toward Vegas, Bryce, or Grand Canyon on our trip day we can choose a canyon that puts you closer to your destination by the end of the day. Full-Day Start times can vary, and your reservation guru will advise seasonally. Recommended start times 6:30am through 10am. Half-Day Start times can vary, and your reservation guru will advise seasonally. Recommended start times 7am through 10am, or 1pm through 4pm. For groups 7 and larger, please call or email for availability. There is an added charge for Half Day trips where we meet you on the East Side of Zion NP. Please inquire for prices. Elevate your Adventure for longer rappels, bigger canyons, swims, loads of fun: Additional $27/person. 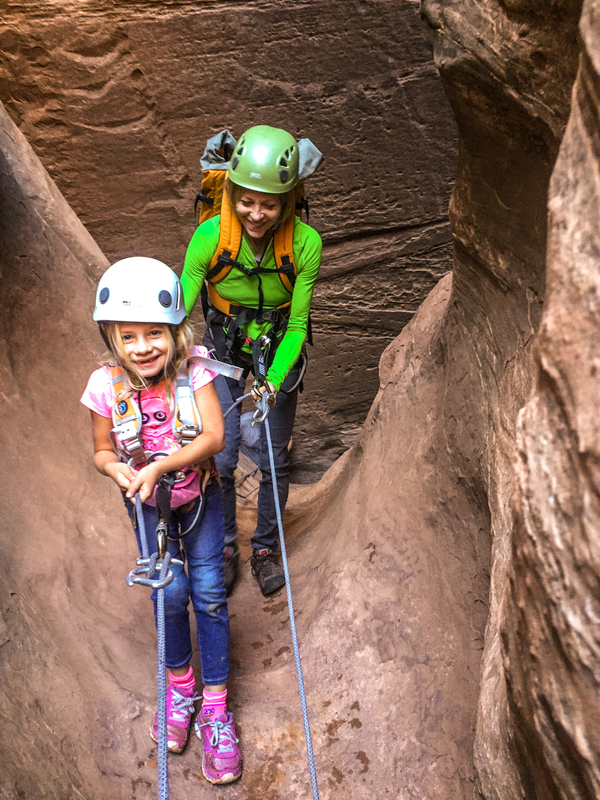 Full-Day Course with the family, then off to a week of self-guided canyoneering adventures. Technical canyoneering curriculum delivery which challenges, changes, and enhances your skills, decision-making abilities, leadership qualities, and rescue skill-sets. We invoke the highest technical safety standards, and empowering educational paradigms emphasizing Leave No Trace, community building within the group dynamic, and interactive problem solving of natural canyon obstacles. We introduce rescue skill sets for problem solving at and beyond your current ability level. Course = safety and rescue courses designed for aspiring canyoneers. CX classes are held in-canyon unless weather forbids. Both half- and full-day CX classes include multiple rappels, some as high as 175’ on full-day trips. Canyon descents may include down-climbing and swimming; if no swimming is desirable just let us know. All courses can be private for an additional charge of $50. We have access to over 25 different canyons in the Zion area, both east and west of Zion. We choose and change our locations to best serve the curricular needs of the group. Please provide your best contact phone number. We will call international number back via WhatsApp. I am ready to book, please send my confirmation and payment link based on the information I provide. I need more info, please reply to me by email so we can clarify my questions. Please provide us with the date you would like to go canyoneering or otherwise when you plan to be in Zion. Please tell us how many people will be in your group or on this trip. Please tell us when and when and where you would like to go with your group and we will get back to you with your confirmation email, OR details, pricing, and itinerary ideas. Thank you! We will get back to you ASAP. We are looking forward to making an incredible adventure with you. Zion Guru is powered by NamaGuides, a pure energy, conscious community organization. ©1996 - 2018 All rights reserved.